The Karachi Biennale , an initiative of peace building by bringing art into public space through involvement from the artist community. 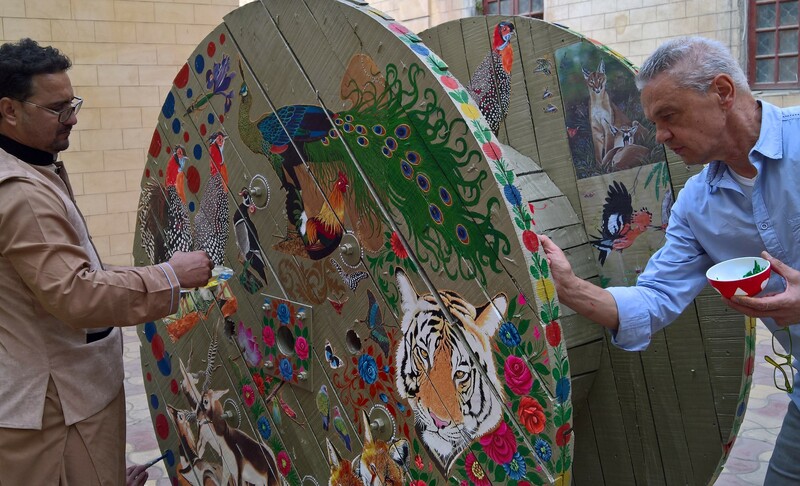 The idea involved the use of 100 original Pakistan Cables reels from the urban environment worked on by artists and involved with communities all over Karachi. A large scale city wide project titled Reel on Hai is to be created. Maurizio Boscheri, Italian artist, participate whit his work. 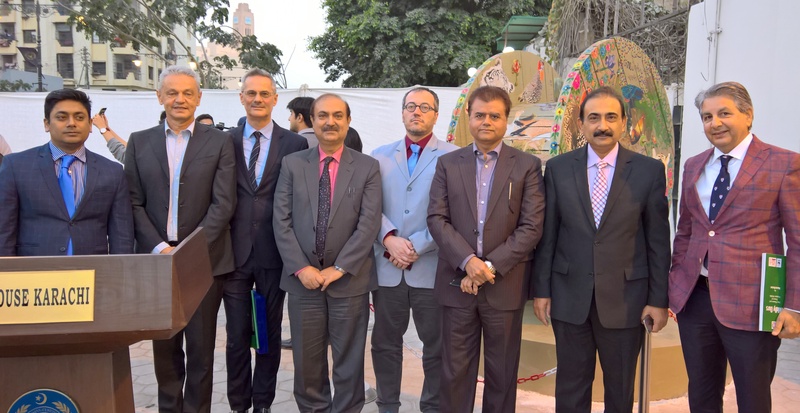 2017 will mark the 70th anniversary of Pakistan, and the reel painted by Maurizio Boscheri wants to be a gift from the Italian people to Pakistan and its people. Pakistan has a great treasure of biodiversity, and as a wildlife artist Maurizio Boscheri has been fascinated by the local fauna …and flora from the first time he landed in Pakistan. 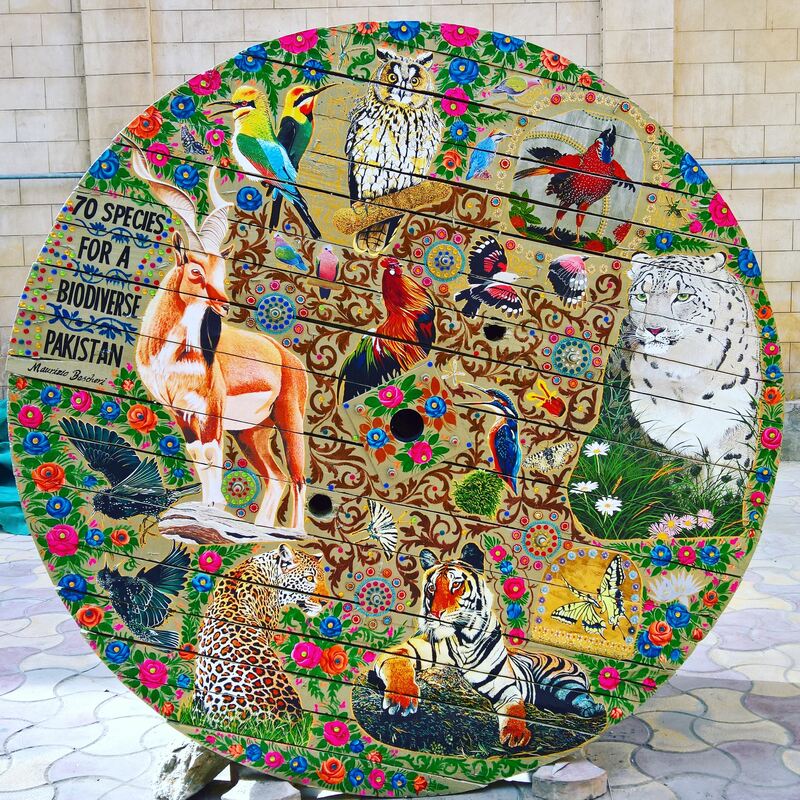 This work of art represents 70 different species of animals, birds, insects, flowers of Pakistan: they may be of least concern, endangered (like the houbara bastards and the snow leopards) or even extinct (the tigers). The objective of this work is to raise awareness on the great biodiversity which has blessed Pakistan, especially among the youth of the Country, who have a right to enjoy these beautiful flora and fauna, and so have the generations to come.